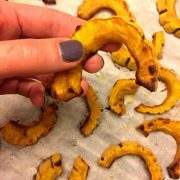 Acorn squash is a fall favorite of many people, but it sure takes a lot of time to bake it, and sometimes it can dry out in the oven. 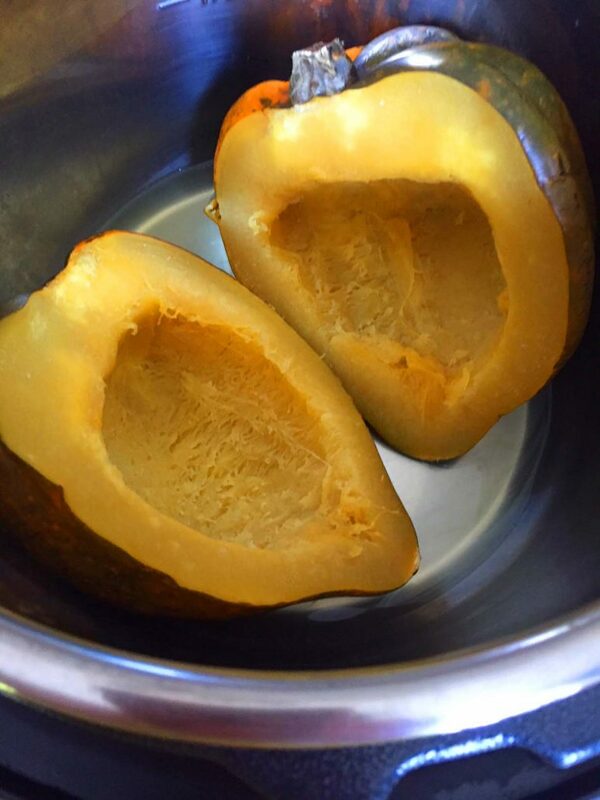 Here’s the solution for tender, moist, perfectly cooked, delicious acorn squash every time, very quick and easy – Instant Pot Acorn Squash! No more hot oven, save on electricity! 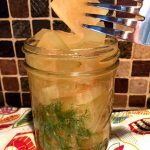 No more worrying if your acorn squash will be underdone, or overdone, or dried out! And if you’re short on time, but want that acorn squash ‘cuz it’s the perfect side for dinner, well, break out your Instant Pot! Instant Pot Acorn Squash is ready with just 15 minutes of cooking time. I love Acorn Squash, and my family does, too. It’s so sweet and tender cooked in the Instant Pot. And, it has fewer calories than Butternut Squash or potatoes, and even more fiber, making it more like a vegetable than other winter squashes. In this recipe, I suggest adding some additional sweetness with maple syrup and cinnamon, which my kids love. Makes it really tasty, and they get all that vegetable goodness, too! 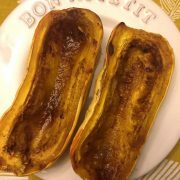 Wondering what it is next to the acorn squash half on my plate? 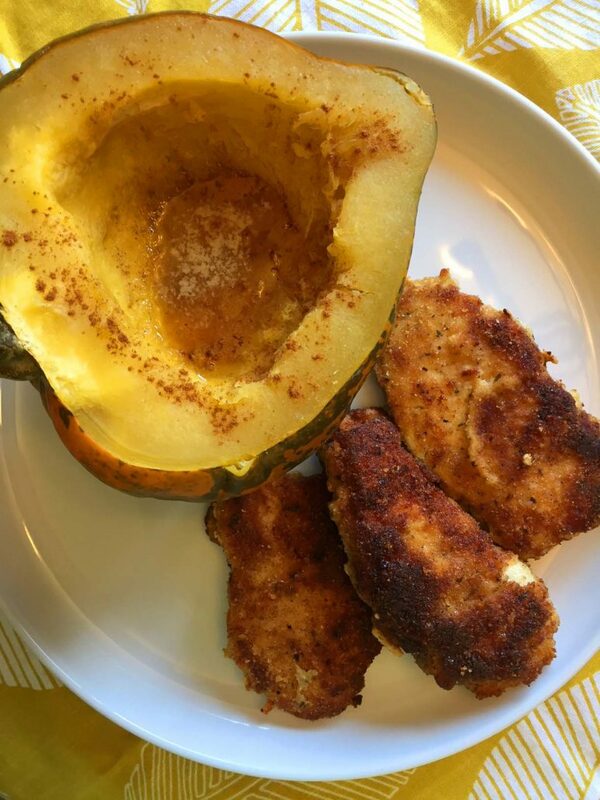 It’s the easiest breaded chicken – you can make it super quick on a frying pan while the acorn squash is cooking! 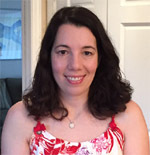 Check out my easy breaded chicken recipe. A full cup of acorn squash contains only about 115 calories, 40% of the RDA of Vitamin C, 26% of the RDA of potassium and 22% RDA of magnesium. And almost 40% of your RDA of fiber! Fiber helps to regulate blood sugar eliminate excess cholesterol in the body Acorn squash also has significant levels of Vitamin A (good for your eyes and skin), and thiamin, pantothenic acid, and other B vitamins. And it provides lots of good-for-you minerals, too: potassium, magnesium, manganese, iron, copper, phosphorus, and calcium. And last but not least, it also has loads of anti-oxidants! I love that this Instant Pot Acorn Squash is so easy, so yummy, and so healthy! 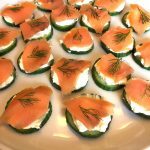 And of course, its gluten-free, and paleo and whole30 friendly! Tips: Vegans, use a little coconut oil! Serve with a spoon to eat – you’ll get all the succulent flesh without tearing through the skin. Or, scoop the flesh out after cooking, and mash up with the butter and whatever seasonings or spices you want. Maple Syrup and cinnamon are a favorite in my house, and if you have a little bacon left over from breakfast (cook an extra slice or 2), crumble or chop that up as a garnish – talk about sweet and savory goodness! No maple syrup? Add a sprinkle of brown sugar. You can also add a splash of orange juice for something a little different. Or sprinkle with chili powder for a spicy version! 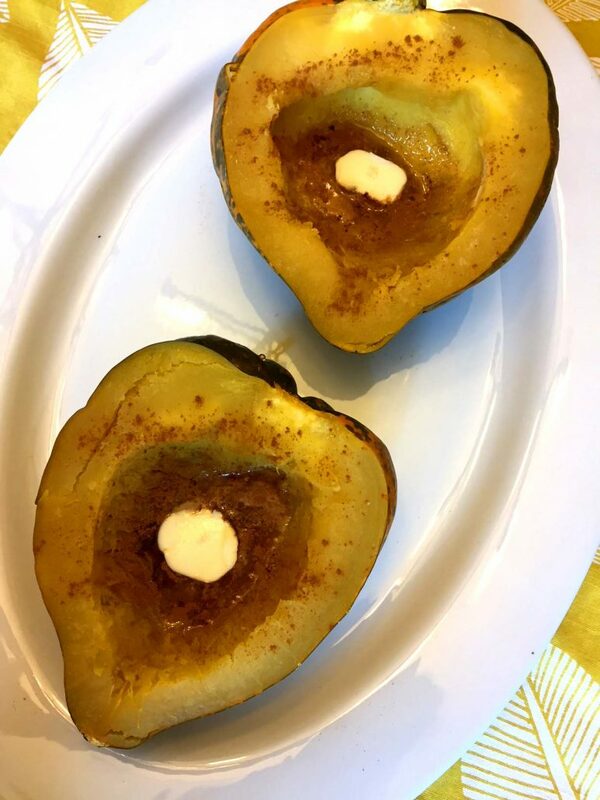 So, pick up a couple acorn squash, break out that Instant Pot, and get ready (in no time at all) for a delectable, healthy treat! 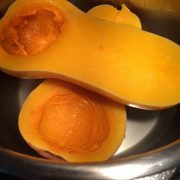 Instant Pot Butternut Squash – perfectly cooked butternut squash in your Instant Pot every time! So tender, smooth and delicious! 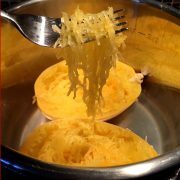 Instant Pot Spaghetti Squash – yes, yet another Instant Pot squash 🙂 Spaghetti squash is a perfect healthy alternative to pasta! Instant Pot Salsa Chicken – easiest 2-ingredient Instant Pot chicken recipe ever! Serve this shredded salsa chicken inside your acorn squash! Instant Pot Sausage – keep a package of Italian sausage in your freezer so you can make this recipe any time for dinner! Instant Pot Peppers and Onions – ready in minutes! Use in fajitas, as a side dish, over rice, you name it – so versatile! 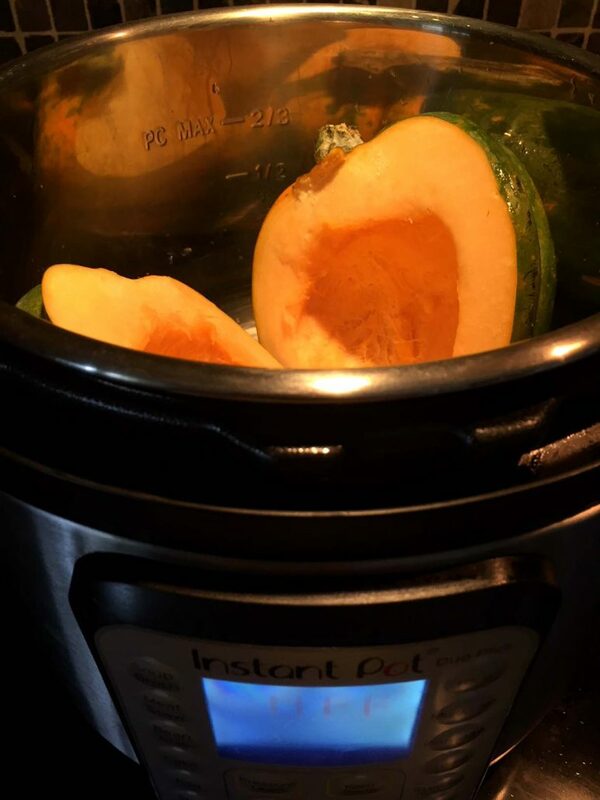 This Instant Pot acorn squash is amazing! So easy to make, just put it in the Instant Pot and the pot does all the work! So mouthwatering, tender perfection! Cut the acorn squash in half. Remove and discard the seeds. 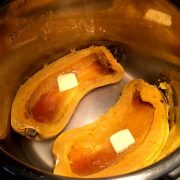 Put the acorn squash halves and water in the Instant Pot. Close the lid and turn the valve to a Sealing position. Press the "Pressure Cook" or "Manual" button and set the time to 15 minutes on High pressure. 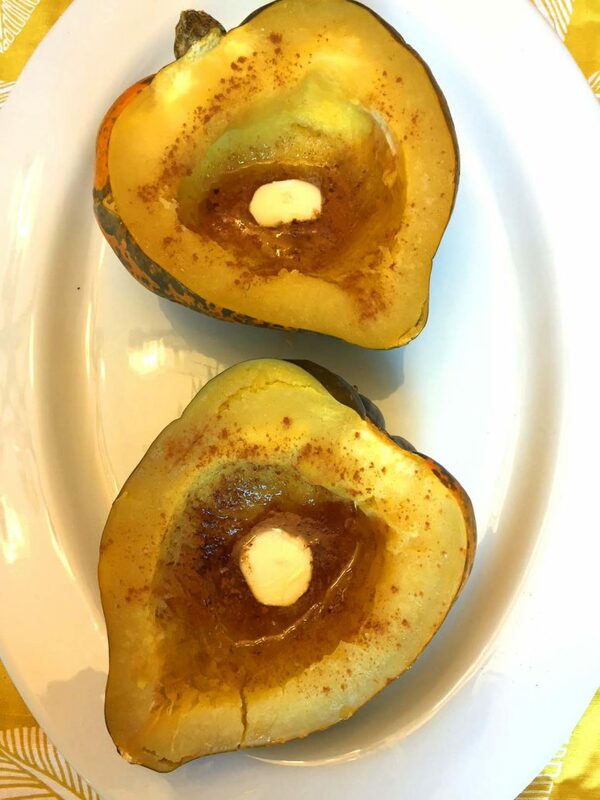 Remove the acorn squash from the Instant Pot, put on a plate and top with butter, maple syrup and cinnamon. 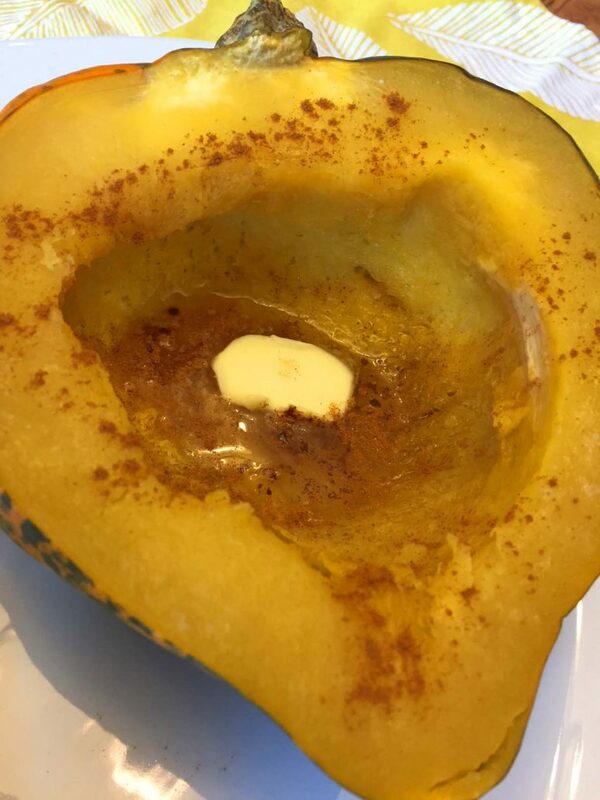 If you prefer to cook the acorn squash whole, just put the whole acorn squash and 1 cup of water in the Instant Pot and pressure cook on High for 30 minutes.